WBSCVT ITI 2018 is West Bengal ITI Admission (WB ITI) entrance exam conducted for admission in Government ITIs/ IITCs/ Jr Polytechnics of West Bengal for the academic session commencing from August 2018. West Bengal State Council for Vocational Training (WBSCVT) is a statutory body under the West Bengal state government for administration and examining Vocational courses in West Bengal. The WBSCVT is inviting the applications for the “M” Group Trades and “E” Group Trades. On this page, the eligibility criteria, application process, result and other important details regarding the WBSCVT ITI are described. The applicants are required to scroll down to get the information. CET 2018 "M" Group is for Class 10 pass out or appearing candidates. CET 2018 "E" Group is for Class 8 pass out candidates. Latest Update: West Bengal ITI Result has been declared on 24 July 2018 for E and M groups. The link to check the same is available on this page. West Bengal ITI has released notification on 18 July 2018 regarding admission into Govt./PPP ITI for SC/ST and PH candidates. Age: The applicants should at least 14 years of age as on 1 August 2018. There is no upper age limit. Trade courses offered by WBSCVT are divided into two groups i.e. E Group & M Group. The applicants can apply for admission in any one of the above groups as per his/ her eligibility. The applicants applying for both the groups will be rejected. The eligibility criteria for both the groups are given below. The applicants applying for the M group should have passed the Madhyamik or equivalent examination under the recognized Board/ Council from any school located in the state of West Bengal. The applicants should have passed Madhyamik or equivalent Examination with Mathematics and Physical Science as subjects are eligible for the admission in Engineering Group of trades. The applicants appearing in the Madhyamik/ Equivalent examination in 2018 are also eligible to apply. However, the applicants have to produce the pass mark sheet and certificate of the Madhyamil/ Equivalent examination at the time of admission. The applicants who have passed Class 8 from any School located within the State of West Bengal under any recognized Board/ Council are eligible for the admission in Government ITIs/ IITCs/ Jr Polytechnics. The WBSCVT ITI application process started by the West Bengal state government and the candidates willing to take admission in Government ITIs/ IITCs/ Jr Polytechnics need to fill the application form. The candidates are suggested to follow the link given below in order to fill the OMR Application Form for WBSCVT ITI Admission through CET. The WBSCVT CET Admit Card was available to download from 12 June 2018 for E group through the link given below. The admit card is available online, Candidates have to download it and take the printout of the same. In the Admit card, the actual date and venue of the entrance examination will be mentioned. The admit card will not be dispatched through the post to the candidates, so no correspondence in this regard will be considered. The candidates who applied under the M category can make the correction in application form against full marks & marks obtained column, the spelling of Name of the applicant, Father’s name, Mobile no, Date of Birth etc. from 11 to 16 July 2018. The link is available on this page. The candidates can also do this offline as well at the Govt. ITI. WBSCVT CET application fees are given below. The application fee for the Kanyashree enrollees is different. The payment of the fee should be done by cash deposit at nearby available help desks. The Application fee once paid by the candidates is non-refundable. The fees given below is for the 1st semester which would be paid by the candidates at the time of admission at the concerned Govt ITI/ ITC/ JP and Govt ITIs running under PPP mode. However, the rest of the fees have to be paid by the student at the beginning of every semester. The WBSCVT CET result has been declared on 24 July 2018 on the official website. The West Bengal State Council for Vocational Training would call the shortlisted candidates for the counselling. Statewide merit list will be prepared for each trade group and will be published on the official website. An SMS will be sent to the candidate's mobile number and email id after the preparation of the statewide merit list provided in the application form containing user ID and password for login to the counselling portal to participate in the choice filling for counselling. One Applicant can provide his/ her choice of trades and Institutes based on the availability of seats in that particular institute. Auto up gradation of seat allocation will be available and the process of the same will be available on the website of WBSCVT. Self-attested photocopy of Certificate of Madhyamik or equivalent examination. 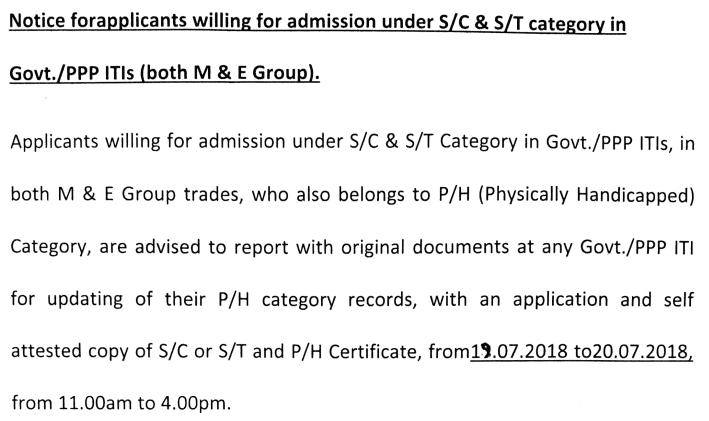 Note: The documents related to the Madhyamik should only be submitted by the M Group applicants and the documents related to the Class 8 should only be submitted by the E Group applicants. Although the rest of the mentioned documents should be submitted by both the applicants. The reservation of the seats is also being provided by the West Bengal government. The seats for the different category would be done as per the following norms were given. However, the 50% of the total seats would be reserved for the District Quota for which the candidates, who passed the entry qualification from the schools located in the district where the concerned Govt. ITI/ITC/JP is located, shall be considered. WBSCVT ITI Application Form - Registration Started!